What Day Of The Week Was April 3? 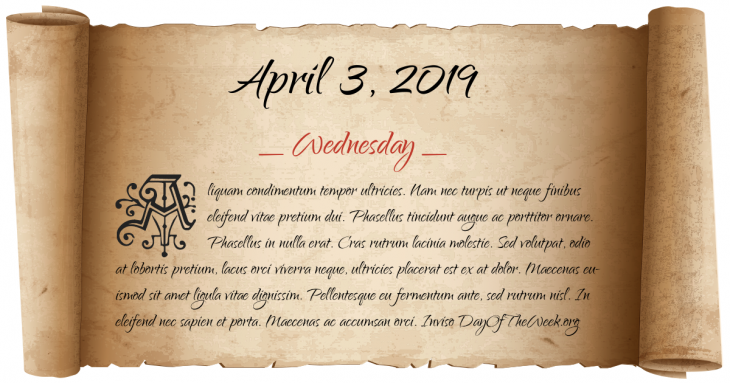 April 3, 2019 was the 93rd day of the year 2019 in the Gregorian calendar. There were 272 days remaining until the end of the year. The day of the week was Wednesday. The first successful United States Pony Express run from Saint Joseph, Missouri to Sacramento, California begins. Trial of the libel case instigated by Oscar Wilde begins, eventually resulting in his imprisonment on charges of homosexuality. In Jeju, South Korea, a civil-war-like period of violence and human rights abuses begins, known as the Jeju massacre. Martin Cooper of Motorola made the first handheld mobile phone call to Joel S. Engel of Bell Labs, though it took ten years for the DynaTAC 8000X to become the first such phone to be commercially released. A United States Air Force airplane carrying United States Secretary of Commerce Ron Brown crashes in Croatia, killing all 35 on board. The Thalit massacre begins in Algeria; all but 1 of the 53 inhabitants of Thalit are killed by guerrillas. Who were born on April 3?